When Jenny M. Luke was studying for a master's degree in history, she decided to explore a subject that had intrigued her when she first came to the United States in the early 1990s. Luke trained as a nurse‐midwife in Great Britain and came to the United States to work as a registered nurse in the labor and delivery unit of a hospital in Dallas, TX. While there, she was surprised by how Americans viewed midwifery. “[In Great Britain,] midwives are trusted practitioners, and that's very different to the way Americans see midwifery,” says Luke. Although Luke hadn't planned to stay in the United States for more than a year or two, she met someone, fell in love, married, settled down in Texas and raised a family. With her children grown, she returned to school to earn a master's degree in history. Her thesis tackled the subject of midwifery in African‐American communities. What Luke discovered is the vital role these women played in not only childbirth, but also women's overall health care in the rural South. Her thesis evolved into the book Delivered by Midwives: African American Midwifery in the Twentieth‐Century South (2018), published by University Press of Mississippi. Luke's education as a nurse began in 1983 with three years of hospital‐based training. After working as a nurse for a year, she did an 18‐month midwifery course. She says midwifery in Great Britain has a very different history than in the United States because in the early 20th century, the Central Midwife Board was established and sanctioned by the government to set structured standards. She wrote the book as a historian, albeit one with background knowledge of midwifery. After completing her master's degree in 2013, Luke began the in‐depth research and writing. A 2017 research fellowship enabled her to complete the project. Luke's research included nursing, medical and public health journals of the time; primary sources from state and county health departments; and personal accounts from practitioners. Luke was surprised that the story of lay midwives in African‐American communities in the rural South had never been told in depth before. Most of what she read simply noted that there used to be midwives, who were the only choice most black women had. Then, doctors came in and midwives were eradicated. 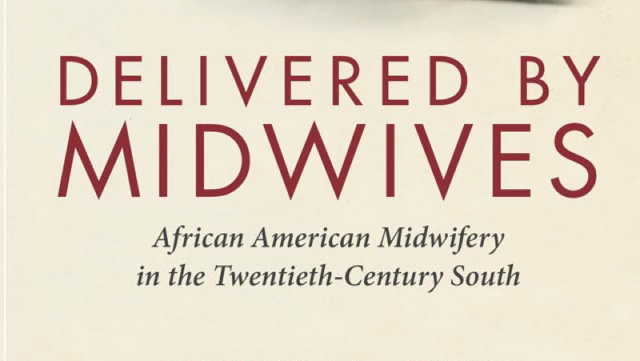 African‐American communities in the South in the early to mid‐20th century had limited access to health care, so midwives carried vital information. The midwives Luke writes about met regularly to check their equipment and discuss cases. One week they had a lecture on oral health from a public health nurse. They went back to their communities and started to teach the women and their families about oral health. An itinerant toothpaste salesman wrote in a sales report that the next time he visited the area, he sold out. “The messenger was so effective in teaching public health,” says Luke. Even as lay midwives were pushed out and clinically trained nurse‐midwives entered the scene, there was still pushback from the medical profession. Even today, there is a persistent notion that midwifery is not part of the mainstream, which Luke sees as detrimental to the growth of professionally trained nurse‐midwives. The lay midwives in the book developed close relationships with the communities they served. Luke hopes contemporary health care educators see emphasis needs to be placed on relationship‐building and trust between patients and health care providers. “Today's nurse‐midwives excel in doing all the things they need to do to improve maternity care,” says Luke, noting that the slogan of the American College of Nurse‐Midwives is “With women, for a lifetime.” The focus on women's health encompasses not only prenatal care, but also in between pregnancies and even post‐menopause. The book stands as a historical record and shows how health care can function effectively even in the most challenging circumstances.